This one worked for me. It's one of those plot concepts where you really do want to ask the author, "Where do you get your ideas?" It's a combination I'd have never come up with, and that alone tickled me. Deceptively simple, comic, and creative. Tongue Biter: Blick. Disgusting, yet fascinating. Story: Very cool. Very atmospheric, great use of first person narration, perfect for this kind of story. Harvey Keitel could play the narrator in the short film version, with Steve Buschemi playing Half-Sneeze Johnny. The reading/acting was great, as usual. Sound effects were dead on as well. G. E. Lee wrote: Harvey Keitel could play the narrator in the short film version, with Steve Buschemi playing Half-Sneeze Johnny. I absolutely loved this episode. It’s exemplary of what makes The Drabblecast the best piece of media coming out every week. Maybe it has something to do with the fact that I was listening while I gave my two kids a bath*, but every single joke hit me just right this week. I loved the way the Drabblenews was handled, especially the description of the pesky parasite as an evil Muppet. I LOLed. Brilliant comedy bridging the beginning and end by quoting The Dark Crystal and pretending it was excerpt from Revelation. There were about a half dozen different jokes packed into one there, all of them good. It was especially funny because, as I was laughing my annoying and girly laugh, I realized that almost nobody would understand why it was so funny. But I did. Oh, did I ever. The story was solid fun. An absurd and quirky premise carried just far enough and written well. The production, as has been mentioned, was superb and really served to enhance the story. 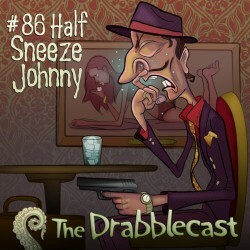 The skillful production of the Drabblecast makes the reading of stories on most other fiction podcasts seem rather dry. Dat's the sh*t I'M TALKING ABOUT! Woot! That was a tall, cool, refreshing glass of awesome! I’m loving these themed episodes,… and the drabblecast has yet again fully explored one more bodily function. I have two female employees who suppress their sneezes to appear more "ladylike". I've been goading them into really sneezing ("Come on, put a dent in the floor!") for some time now, and making progress. I have a feeling this story may have been inspired by a similar situation. Someone who doesn't sneeze at work (uncomfortable) but who does sneeze at home (comfortable). One of them listened to this episode this afternoon and was really impressed by the music. She wants to know what the piece is and who performed it. enjoyed this story all round. something that caught my attention: at one point the narrator says that Johnny's unnatural sensitivity to people's motivations was 'enough to make me believe in physics.' was that actually the line? i could see this character saying something like that. deflective wrote: enjoyed this story all round. I noticed that too. I hoped it was intentional (that the narrator didn't know the difference between "physics" and "psychics"), but feared that it was accidental (that Norm doesn't know the difference between "physics" and "psychics"). I hoped it was intentional (that the narrator didn't know the difference between "physics" and "psychics"), but feared that it was accidental (that Norm doesn't know the difference between "physics" and "psychics"). It was actually written as "psychics," but the mistake does seem somewhat in keeping with the character, so that's all right. Thanks for the comments, everyone, and thanks, Norm, for the great narration. Loved the enhancements. Fun drabble, Peter. A sneeze-themed episode. Who'd have thunk it? As for the tongue biter... Eww. I'm going to share that story with everyone I know so that they have nightmares, too. Ya, that was my bad- not much sleep lately! I didn't want to go back and fix that and then figured this guy would maybe confuse them so used it as an excuse to be lazy. Kurt wrote: Thanks for the comments, everyone, and thanks, Norm, for the great narration. Loved the enhancements. be sure to submit again, it's fun to hear americans pronounce saskatchewan. Thanks to everyone for the positive reactions to my Drabble, I was a bit nervous knowing I was about to lose my Drabblecast virginity, but you have all been so gentle and it felt so good. Frakking great show all the way around. And like tbaker2500, the story reminded me of a person at work that does the sneeze suppression deal. Just sneeze already. It is more distracting hearing the squeal. I'd like to kick that little tongue biter right between the eyes. That dirty mofo! Allergies had me sneezing out a big wad of pitty for that poor character. No respite even in heaven. Half-Sneeze Johnny was fantabulous. The reading really brought the character to life and it felt like there was a lot of story crammed into that little chunk of time. It wasn't among the more odd and bizarre stories the Drabblecast has offered seeing as how all the characters were human, experienced relatively normal bodily functions, and were actually alive... but it was definitely enjoyable none the less. I loved this one, but I know I've been listening to the Drabblecast too long when I find a story believable. Thanks again for the comments, ya'll. Jeez, I'll look around for em. Both were traditional Italian folksongs- as per performers, I'll letchya know. Twas free and hard to track, almost did em myself. Eh, don't bother. I'm sure she's forgotten by now.